Do you milk goats or cows? If so then you probably use a teat spray or teat dip after milking to prevent mastitis. I used to use this popular spray. The problem with this is that regular teat sprays are full of chemicals! Now I have started making my own using essential oils and other great ingredients that have historically show to create an environment that bacteria can not thrive in. I tend to be a very natural person. After all, I am the Organic Goat Lady! So I’ve always hated using the regular sprays! Anything that contains ingredients that you can’t pronounce, scares me a little! Especially when it’s cotton candy blue! I cringe every time that I use it! Now, you’re probably wondering why, being an Aromatherapist, I ever even used a chemical laden spray to begin with? The answer: Fear! Fear of mastitis! Mastitis is something that you hear goat veterans talk about when sharing goat horror stories! I did not want my goat to be one of the ones that wouldn’t produce from half of her udder, or who got extremely ill from a nasty case of mastitis! Everybody in the goat world uses these sprays. I have run into some that use bleach, but I really wasn’t crazy about that idea either. So I just stuck with my chemical spray, thinking that it was the only way to go. But even while using the chemical spray I had a goat come down with a mild case of mastitis. It’s the only case we’ve ever had and it wasn’t bad, but it was a pain! I had to send off milk samples to the lab, treat the goat for mastitis by injecting stuff into the udder (not very pleasant for the goat or the person administering! ), send off more milk samples to make sure it was gone. Like I said, a big ordeal! Not to mention that I’m sure mastitis isn’t pleasant for the goat either! So fear caused me to keep using the chemical sprays! The purpose of teat sprays is to kill any bacteria on the teat until the orifice (this is the small hole that the milk comes out of) has closed, to prevent any bacteria. From what I’ve read this usually takes about 15 minutes so it is best to keep the animal from lying down for approximately 15 minutes after spraying. Knowing that this is the purpose of the Spray, I realized that the faith that I have in essential oils to kill bacteria is stronger! I know from my own experiences what essential oils are capable of! See my post How I Became and Essential Oil Believer to read more about how essential oils have helped me. So if the purpose of the spray is to kill bacteria, why would I not make my own spray with natural ingredients that have been shown to create a healthy environment and benefit the goat?! Coming to this realization eliminated my fear! So I sat down and formulated my Essential Oil Teat Spray! To learn more about preventing and treating mastitis in goats, in addition to everything else you need to know to care for your goats, check out the Raising Goats For beginners Course! This course has step by step lessons, videos and PDFs for everything from goat illnesses, feeding, milking, you name it! It will help you to raise your goats with confidence, as well as provide a group for personal help and support! First, let’s discuss the stars of our spray, the essential oils! I use three different essential oils in my spray. 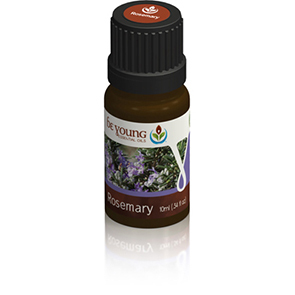 First, up is Rosemary essential oil! Rosemary essential oil has historically been shown to provide an environment that bacteria and fungus can not thrive in. Rosemary has also been shown to have an astringent like affect on the skin. This made it an excellent choice for my spray! An astringent is something that helps to shrink and contract the skin. I incorporate this Oil in my blend to encourage the orifice to close, making it harder for bacteria to enter the teat. 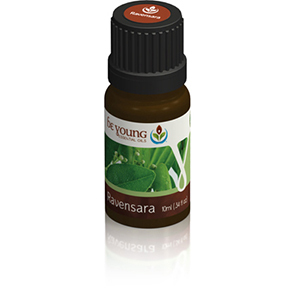 Our second essential oil is Ravensara! Ravensara essential oil is also historically shown to provide an environment that bacteria, fungus and viruses can not thrive in. To learn more about the amazing benefits of Ravensara essential oil read my post Seven Essential Oils That You NEED to Have in Your First Aid Kit!. The third essential oil is Lavender! Lavender is an essential oil that everyone is familiar with. I use this Oil for the same reason as the above Oil. It too provides the body with tools to create an optimal environment. As mentioned above in reference to rosemary, Lavender also is historically shown to have an astringent effect. This gentle, yet powerful, essential oil is an excellent addition to our spray! Now that we have our essential oils, we need a base for our Teat Spray. We are actually going to use two different ingredients for our base. The next ingredient is Colloidal Silver! 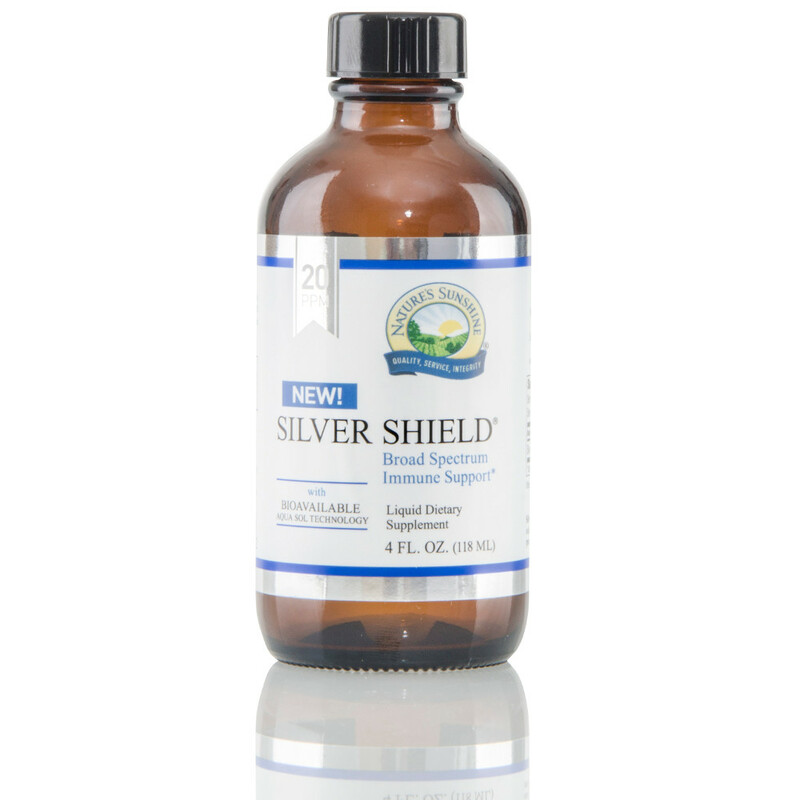 Colloidal Silver historically has been shown to provide immune support, allowing the body to have the optimal environment that viruses and bacteria cannot thrive in. I use this in my hand sanitizers, room sprays etc. It is excellent to use in our Teat Spray! The last ingredient is Plant Enzymes! 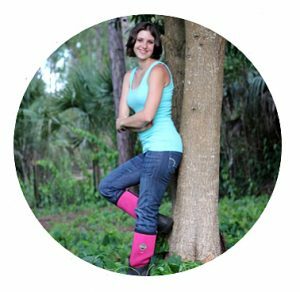 The plant enzymes that I use are derived from vegetables and fruits and are hypoallergenic. They have so many uses! Plant enzymes are a must for every household! Plant enzymes hydrate the skin and activate the bodies own healing mechanisms. They destroy protein structures, which allows them to assist in breaking down bacteria. Does that not sound like the makings of a pretty powerful Teat Spray?! 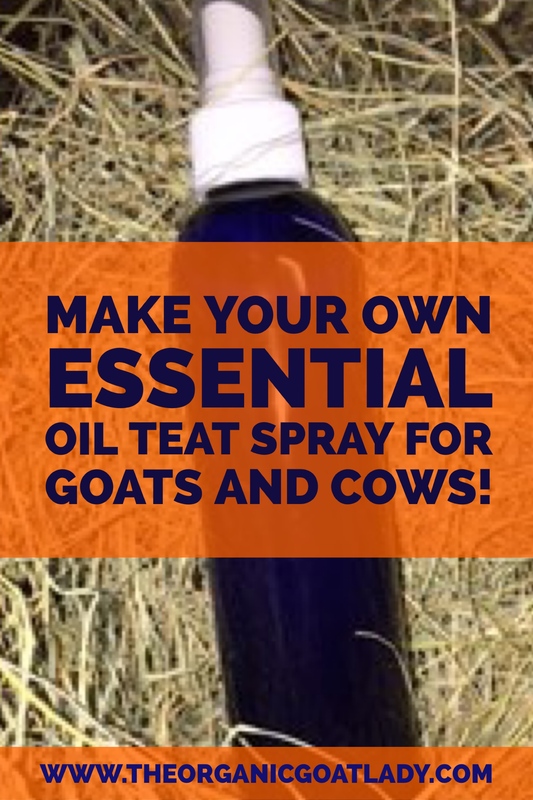 After formulating this spray and knowing the ingredients that I have added, I feel confident that my goats will be very happy and have very healthy udders! Also, another benefit is that when spraying your goats, you will get some of the spray on your hands. So, you also will benefit aromaticallyfrom this spray! Feel free to give your hands a squirt! Using it as a hand sanitizer while milking, will help to keep your hands clean so that you aren’t passing things on to your goats teats! If you are looking for a good spray bottle, this is the type of bottle that I use. It is a PET spray bottle, which means that it does not contain the harmful chemicals that regular spray bottles contain. 1. Clean the goats udder before milking. I use baby wipes! 2. Hand Milk. I know this might not be possible if you have a lot of goats to milk. But if you aren’t careful a milk machine will spread mastitis and bacteria from one goat to another if you have an infected goat and are unaware. You definitely want to milk any goats that have mastitis by hand and discard the milk. 3.Keep the goat from lying down for about 15 minutes after milking. We let our goats remain on the milk stand until they have finished eating. Then we move them back to the field where we give them some hay to munch. This keeps them on their feet for much longer than the recommended 15 minutes. Ok, so now you know why and how I chose to make my own teat spray, the ingredients, and additional mastitis prevention tips. You’re probably wondering when I’m going to stop talking and give you the recipe! Well, there you have it! I hope you enjoy the spray. Let me know if you give it a try! Do you have a natural teat spray that you already use? 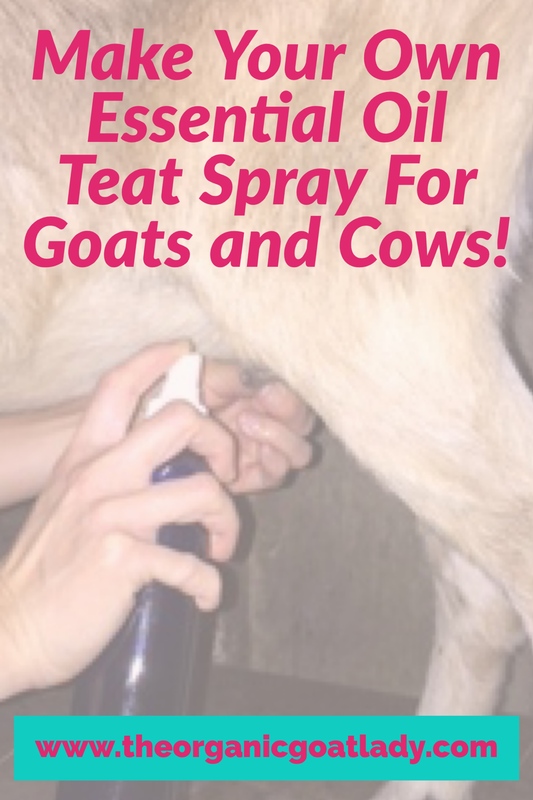 Do you use a teat spray or a dip? I would love to hear from you! Please leave me a comment below ? Pleae visit my disclaimer page to read my full disclaimer and disclosure. Can this be used to clean the teats prior to milking rather than baby wipes? I like to use the wipes because it allows you to remove any chunks that just spraying will not remove. You don’t want anything falling in your milk. Also I like to use the EO spray after rather than before because essential oils can be strong and you don’t want them to flavor the milk.